Each pleural cavity is completely lined by a mesothelial membrane called the pleura. The latter is a serous membrane arranged as a closed invaginated surface. During development, the lungs grow out of the mediastinum, becoming surrounded by the pleural cavities. As a result, the outer surface of each organ is covered by pleura. The pleura lining the walls of the cavity is the parietal pleura, whereas that reflected from the mediastinum at the roots and onto the surfaces of the lungs and interlobar fissures is the visceral pleura or pulmonary pleura. The space formed between the two is called pleural cavity. The parietal and visceral layer are continuous at the hilar structures. The lung does not completely fill the potential space of the pleural cavity, resulting in recesses, which do not contain lung and are important for accommodating changes in lung volume during breathing. 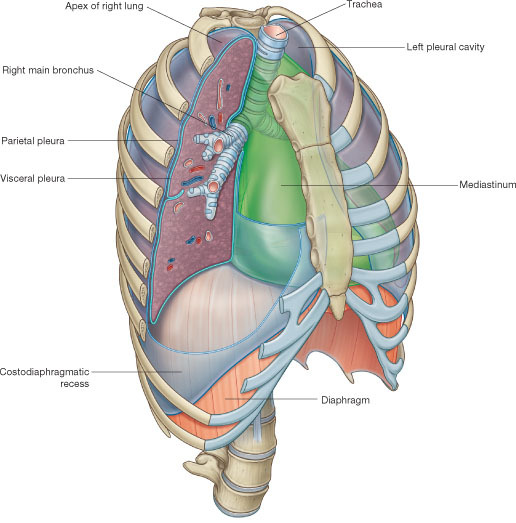 The costodiaphragmatic recess, which is the largest and clinically most important recess, lies inferiorly between the thoracic wall and diaphragm.